A recent study proves that pigeons in New York City are addicted to nicotine. How is this possible? Pigeons don't smoke. Based on the assumption that pigeons in the city consume copious amounts of nicotine in discarded cigarette butts, this study set out to prove that the birds were hooked on the chemicals in the cigarettes. Sure enough, the study found that, "most pigeons in New York City take in the same amount of nicotine each day as a human who smokes an entire pack of cigarettes." "We immediately noticed a large majority of the pigeons display external signs of chemical addiction. They are often found standing in a group outside of a building. They twitch often and look around with sharp turns of the head. They have anti-social tendencies and are quick to fly when confronted. Their breath smells terrible and they leave droppings everywhere they go. After thorough research we have proven that 98% of pigeons in New York City are hooked on nicotine. Each of the birds in the study reek of smoke and are constantly fidgeting and adjusting their wings. We have also observed the hoarse, raspy mating calls of these nicotine-addicted birds." Cigarettes are the most littered item in Manhattan. Although the city has strict policies against littering and frequent trash collection it seems there is little that can be done for this unfortunate situation. New York City spends approximately $500,000 annually on the disposal of cigarettes. Regardless of policy and cleanliness it seems the birds will find a way to get their fix. This is hardly a new phenomenon. 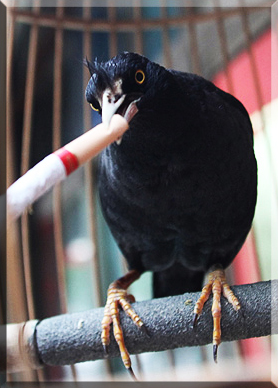 There was a Mynah in China several years ago that would request a cigarette every morning after seeing it's owner light up. The Mayor has started a new program to help these city birds break their addiction. If you notice a pigeon displaying signs of nicotine addiction call 311 to report it and get it the help it needs. * March, 2013 artcile: Are Butts the New Bottles? Sheesh!! Need to get these poor pigeons on the NicoDownPatch-for-Birds(TM) ASAP!!! Otherwise, what will happen when people stop throwing away enough butts??? 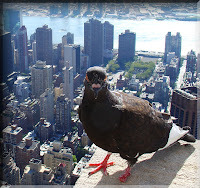 There will be large flocks of foul-tempered fowl on group nic-fits, terrorizing NYC!!! Hitchcock's "The Birds" will look like a day at the petting zoo!!! !